The Ford Expedition hasn’t seen a full redesign since 2007, but that doesn’t mean Ford has been neglecting this full-size SUV. Cosmetic changes are minimal this year to the point that you won’t notice until someone shows them to you, but there’s big news under the hood, as Ford does away with the V8 engine in favor of a more fuel-efficient EcoBoost V6. There are a wide range of Expedition trims to choose from, eight in all, and every one features the new 3.5-liter V6 EcoBoost with 365 hp and 420 lb-ft of torque paired to a 6-speed SelectShift automatic transmission. There's no option for a V8 in the mix. The base Expedition is the XLT, which starts at $44,585 and is also offered as the XLT EL with a longer wheelbase. Standard features on the XLT include manual air conditioning, rear auxiliary climate control, power windows and door locks, illuminated entry lighting, power-adjustable foot pedals, a reverse-sensing system, and rear-view camera. There’s also a 110-volt AC power outlet, leather-wrapped manual tilt/telescoping steering wheel with audio controls, and cruise control. There's also seating for 8 passengers with standard front cloth bucket seats, a 40/20/40-split bench second row that folds flat, and a third-row 60/40-split bench that also folds flat. Available options include leather-trimmed first and second rows with a 10-way power driver’s seat and 6-way power passenger seat, power liftgate, and power-folding third row. A second option package builds on the first with the addition of a heavy-duty trailer towing package, heated and cooled front seats with a 10-way power-adjustable passenger seat, and a 12-speaker Sony audio system. Infotainment comes through the Sync with MyFord Voice voice-activated system. It features a 4.2-inch center display with AM/FM/SiriusXM satellite radio, a single-disc CD player, USB port, and AppLink. Outside there are chrome exhaust tips, LED front fog lamps, quad-beam reflector headlamps, running boards, front tow hooks on 4-wheel-drive (4WD) models, black luggage-rack side rails, and a liftgate with flip-up glass. Rear-wheel drive (RWD) is standard with AdvanceTrac with Roll Stability Control and traction control. Optional Control Trac 4WD is available. Trailer sway control is also standard for towing up to 9,200 pounds with an integrated trailer brake controller available as a part of the Heavy-Duty Trailer Tow Package. The long-wheelbase XLT EL keeps standard features the same, but adds a few additional option packages. The XLT Premium package includes dual-zone electronic automatic temperature control, a premium AM/FM stereo with single-CD player and subwoofer, leather-wrapped shift knob, and woodgrain interior trim accents. The Limited turns many optional features standard and adds more luxurious packages. The heavy-duty trailer-towing package becomes standard, as does perforated leather-trimmed heated and cooled front bucket seats, HD Radio, a power liftgate, and second-row heated outboard seats. Dual-zone climate control, woodgrain trims, a leather-wrapped power tilt/telescoping steering wheel with audio controls, remote start, and forward sensing system are all standard on the Limited. Optional features include a power moonroof, power deployable running boards, blind-spot information with cross-traffic alert, and voice-activated navigation with HD radio. The infotainment system gets an upgrade to Sync with MyFord Touch featuring an 8-inch touchscreen and 2 USB ports and optional dual headrest DVD systems. The Limited EL adds only the longer wheelbase this time without any additional features. The King Ranch, also available as an EL long-wheelbase model, comes with its own special trims including Mesa Brown leather seats, Caribou-color lower bodyside cladding and wheel-lip moldings, King Ranch exterior badges, power deployable running boards, and a power moonroof. Front seats have three levels of heating and cooling, and the King Ranch logo is emblazoned on the seats and center armrest, while second-row reclining bucket seats are optional. The steering wheel and shift knob have matching Mesa Brown leather. At the top of the lineup is the all-new Platinum, which starts at $59,370 along with the Platinum EL at $62,020. These pretty much take every optional feature, except the King Ranch badging and trims, and make them standard. Your few optional choices include all-weather floor mats, dual headrest DVD systems, second-row reclining bucket seats, and the Control Trac 4WD system. The most distinctive thing about the Expedition is its size. This is a large SUV with running boards that aren’t just for looks, but a necessity for climbing inside. It easily holds 8 people with plenty of room for cargo, and it looks good, but its age does show. The exterior is not as modern and slick as that of many competitors. 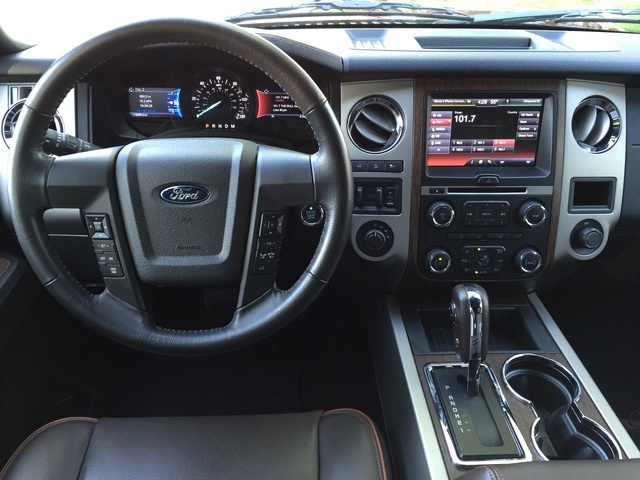 Inside, it's comfortable and appealing, especially in the King Ranch edition we tested, but it needs an update. It feels a little like a new old SUV in need of some refinement, better trims, and more modern styling. It’s a shame given how well this car serves its purpose of carrying 8 people and cargo that the style doesn’t keep pace with function. Despite looking a bit dated, the new Expedition doesn’t drive like an older vehicle at all. The 3.5-liter V6 EcoBoost with 365 hp and 420 lb-ft of torque easily powers the large Expedition down the highway, and the 6-speed SelectShift automatic transmission has no trouble picking the right gear. You might think the missing V8 would be noticeable, but it’s not. There's never a time when you feel that the Expedition is wanting for power. The suspension is smooth and evens out the rough spots in the road, and brakes are solid with controlled stopping and very little nosedive. If ever there was a vehicle that gave a command position, this is the one. There is, however, a good amount of bounce and sway at highway speeds. Combine this with the feeling that you are taking up every inch of your lane with no room to spare, and that bounce can be unnerving in heavy traffic. It’s forgivable, given that this isn’t a sports car but an 8-passenger SUV. It handles less like a truck than its looks would imply and offers an impressively quiet ride. You can carry on a conversation with third-row passengers even in driving rain, which can be difficult with considerably smaller vehicles. We had the chance to load up the Expedition for a short road trip, and it reminded us why huge vehicles like this are still so popular. Fitting cargo in the back was easy, and the third row, even though we didn’t need it for all of our passengers, still let people spread out and have their own space. Members of a larger family won’t hate each other after a few hours in too-close quarters when they’re in the Expedition. Fuel economy is improved over last year, but this is a big vehicle, so you will be stopping at the pump, and it will tap your wallet. The Expedition is EPA rated at 15 mpg city/20 highway with our average coming in at 16.8, just under the combined rating of 17. The Expedition is a great example of a vehicle that delivers exactly what it promises. It has ample room for 8 with seats that can easily be reconfigured to allow for various combinations of people and cargo. It's comfortable, quiet, and an easy ride, even for long trips. Cargo space galore means you can pack in people and their stuff and still not feel cramped. 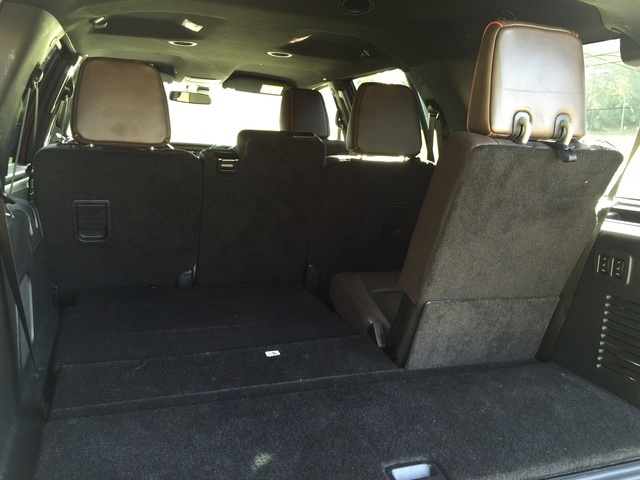 The Expedition offers 18.6 cubic feet behind the third row, 55.0 cubic feet behind the second row, and 108.3 cubic feet behind the first row. That impressive cargo capacity goes up in the long-wheelbase EL trims to 42.6, 85.5, and 130.8 for those who need even more room. The additional 9,200 pounds of towing capacity lets you take everything you need for any adventure. There are storage cubbies everywhere, including several bins up front that are perfect for holding keys, phones, wallets, or whatever you happen to have in your hands when you take a seat. The center console has USB plugs for easy charging and is nice and deep. The pockets on the backs of the front seats are even useful, large enough to hold things rather than being so tight they can’t hold much beyond a slip of paper. Controls are well placed with chunky knobs that are easy to grab with gloved hands. They’re all within easy reach and don’t require leaning awkwardly forward, a nice accomplishment in a large vehicle. 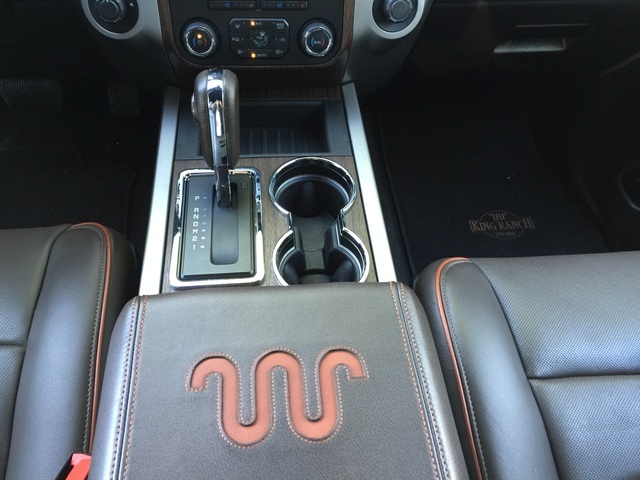 The King Ranch edition we tested has beautiful Mesa Brown leather throughout, along with the King Ranch logo, all of which make it feel a little more special. Front seats have three heating and cooling settings and are power adjustable. Given the Expedition’s size, seat adjustability is important simply to have a clear view over the hood. The pedals are also adjustable, which is perfect for those with shorter legs. The right position was easy to find for both tall and short drivers, so no one was left at a disadvantage. Unfortunately, the extra King Ranch touches and well-planned controls aren’t matched by the overall look of the interior. There are lots of hard plastic surfaces alongside wood finishes, and this cheapens the Expedition. Its one failing is that it hasn’t been updated in far too long, and it's starting to show its age in a market with plenty of all-new competitive models. Thankfully, Ford has not ignored the technology in the Expedition. Vehicles feature either Sync with MyFord Voice or the enhanced Sync with MyFord Touch. Those looking for the newest iteration of Ford’s infotainment system, Sync 3, have that option only if they go with the 2016 model year. The MyFord Voice system, found only in the XLT trim, has a 4.2-inch screen and voice activation, so you can make calls, listen to music, and select apps, all with your hands on the wheel and eyes on the road. It also includes AM/FM/SiriusXM satellite radio, a single-disc CD player, USB port, and, as an added safety feature, 911 Assist, which can call for help during an accident. Once your phone is connected to the system, even if you can’t dial, a qualified crash event will automatically make the call for help. Optional on some trims and standard on higher trims is navigation with SiriusXM Traffic and Travel Link. Dual headrest DVDs and an upgraded Sony audio system with 12 speakers are also optional. The enhanced MyFord Touch system, optional on the XLT and standard on all other trims, adds two 4.2-inch screens in the instrument cluster, a larger 8-inch center touchscreen, and a second USB port. The larger screen is much easier to use and divides the system into quarters with phone, navigation, entertainment, and climate each owning one quarter. The increased screen size makes it easier to read at a glance and makes it easier to find what you’re looking for quickly. Overall, the system is intuitive and responsive. Voice commands are generally understood the first time, so you’re not sitting in your car screaming into the air in frustration as you try to clearly enunciate every last word. Menus are well-organized, so you can adjust settings and find what you’re looking for quickly. The MyFord Touch system is far superior and is worth the price to upgrade the XLT’s more dated MyFord Voice system. Those who stream music and want to take full advantage of all these systems offer will be much happier with MyFord Touch. The size of the Expedition immediately imparts a certain sense of safety. It’s bigger than almost anything else on the road. It also has plenty of standard safety features, including 6 airbags, rear-door child-safety locks, power 4-wheel antilock disc brakes with electronic brakeforce distribution, a tire pressure monitoring system, and SOS post-crash alert system. RWD versions feature AdvanceTrac with Roll Stability Control and traction control with Control Trac 4WD as an available option. Trailer sway control with an optional integrated trailer brake controller make towing safer and easier. 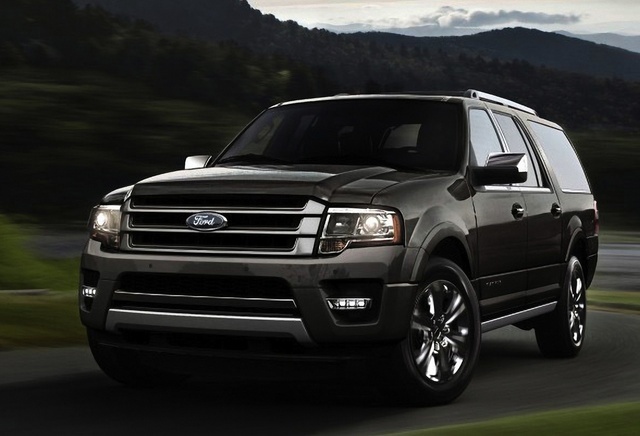 For the first time ever in any Ford model, the Expedition offers a continuously controlled damping suspension. This system of electronic sensors keeps constant tabs on steering, braking, and body motion to make adjustments to fit road conditions. Drivers choose Comfort, Normal, or Sport settings to get a customized level of control. National Highway Traffic Safety Administration (NHTSA) crash-test ratings are 5 stars overall for all models. Frontal and side crash ratings are 5 stars on all models, while the rollover rating varies depending on the trim you choose. All 4WD models earn 4-star rollover ratings, while RWD versions earn only 3. A standard rear-view camera and reverse-sensing system use ultrasonic sensors to detect objects near the bumper while backing up at low speeds. The system then sounds a tone that becomes faster the closer the car is to the object. An optional forward sensing system, blind-spot information system, and cross-traffic alert are also available. A large vehicle can be daunting, but the suite of standard and available safety features on the Expedition combined with solid handling and braking impart a sense of confidence while on the road. The Ford Expedition is not an inexpensive vehicle with a starting price of $44,585 that creeps up over $60,000 for the best-equipped versions, but that doesn’t mean you’re not getting significant value for your dollar. Rivals like the Chevrolet Tahoe and GMC Yukon are in the same price range, so pricey though it is, it’s still in line with the market for this type of vehicle. Fuel economy has improved thanks to this year’s EcoBoost V6 engine, with EPA ratings of 15 mpg city/20 highway/17 combined and our average coming in at 16.8. That makes the ratings pretty spot-on during our test drive. Big SUVs aren’t fuel-economy stars, so you’re going to have to stop at the pump frequently if you do a lot of driving. If fuel economy is a huge issue and your need for huge passenger and cargo space is infrequent, this is not an ideal daily driver. There’s a trade-off when you buy large SUVs: You pay more for gas, and you pay more for the vehicle in exchange for impressive cargo capacity, towing, and passenger room. Warranty coverage includes 3 years/36,000 miles bumper to bumper, 5 years/60,000 miles for the safety-restraint system, 5 years/unlimited miles against corrosion (perforation only), and 5 years/60,000 miles of roadside assistance. 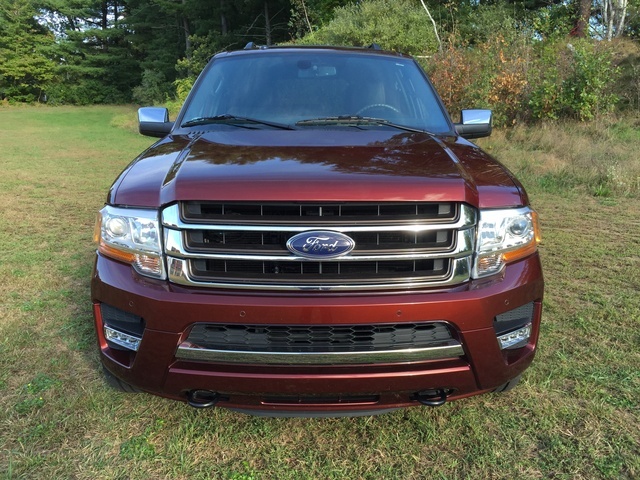 What's your take on the 2015 Ford Expedition? John I'm purchasing a 2015 Limited. Is the new load leveling option a must have when towing a boat? I tow a 5,500+ lb boat several times a year. Generally, I'm not hauling much in the back of the car except a few mulch trips every spring. Thoughts? 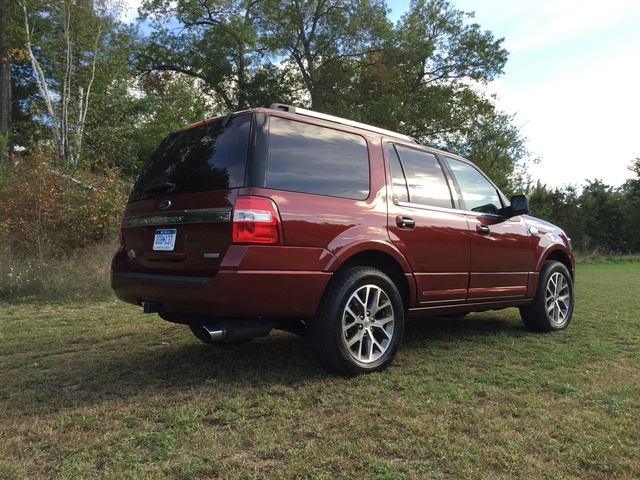 Users ranked 2015 Ford Expedition against other cars which they drove/owned. Each ranking was based on 9 categories. Here is the summary of top rankings. 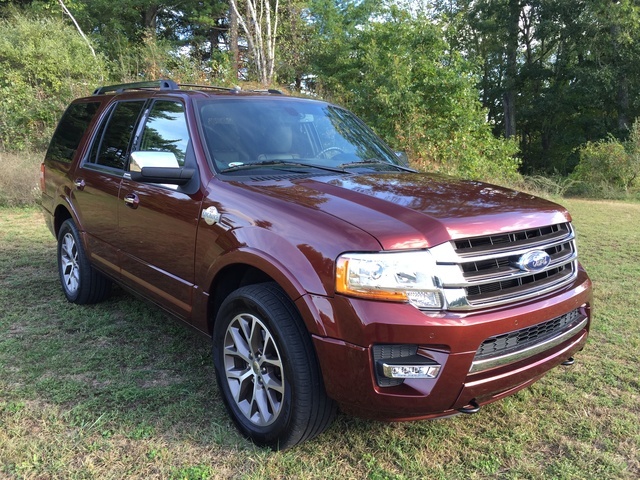 Have you driven a 2015 Ford Expedition? My 2015 Ford Expedition Is Terrible In Snow. 2015 Ford Expedition Cabin Air Filter Where Is It ? 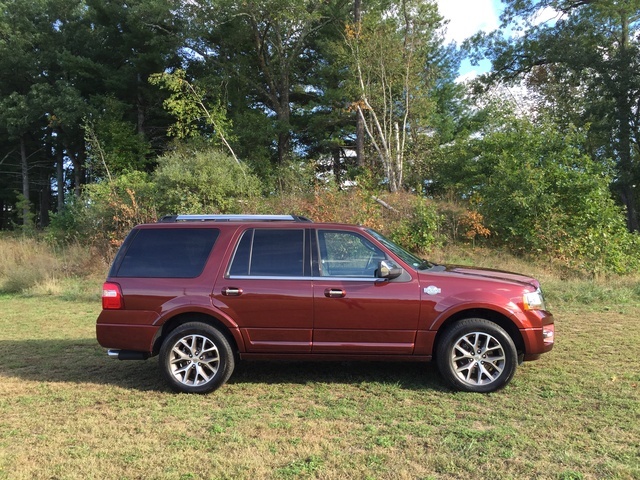 What is the smallest wheel size that I can fit on my 2015 Ford Expedition e l Limited? I want to go with an old school wheel and tire package. 2015 Ford Expetion AC Blows For 3 - 5 Seconds And Then Shuts Off.